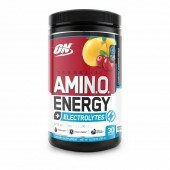 Now your favourite Amino Energy from Optimum Nutrition is available in TWIN PACK for just $50.00! Buy now and fuel up your body with the essential amino acids for a very reasonable price! Rock Hard Supplements had cut the cost for you, so hurry and grab yours! It comes with a variety of Fruit, Coffee, and Tea flavours! Everybody wants a lean, muscular physique. Like anything worth having, wanting it isn’t enough. You have to commit to a rigorous diet and training program that will tax your strength mentally as well as physically. To help you satisfy both of these demands, ON’s Essential Amino Energy combines the optimal ratio of rapidly absorbed free-form amino acids with natural energizers and N.O. boosting ingredients to help you reach your next level – including muscle-building BCAAs and arginine for more intense, vascular pumps. At 10 calories per serving, it’ll make a big impression without denting your diet. Mix up Essential Amino Energy anytime you want to dial up mental focus, physical energy N.O. production, and recovery support. True Strength is a journey. It never rests, it never quits. It's about overcoming obstacles, accomplishing goals, and recognizing achievements. And then it resets to achieve again. As your trusted sports nutrition partner in goal achievement ON demonstrates that same passion while crafting our products. From the raw materials, we source to our state-of-the-art manufacturing processes, no compromises are made. You set the bar higher after every workout, we set the bar higher to redefine the industry standards and ensure you realize optimum results.